When was the last time you used a Camera app on your smartphone or tablet and you said ‘wow’? 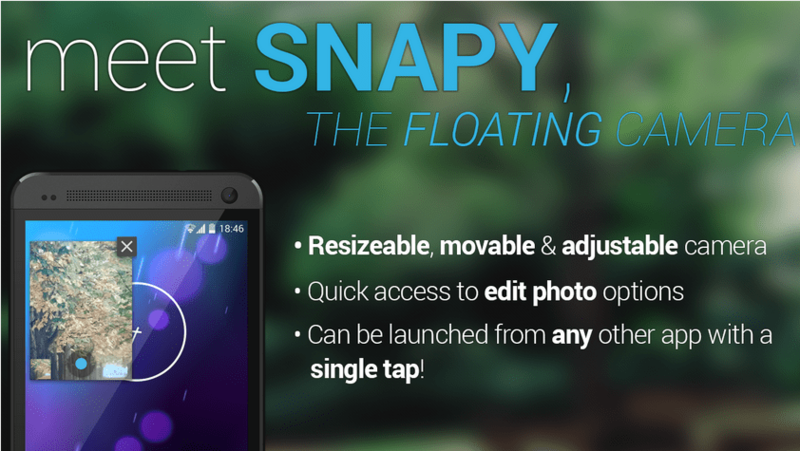 Because today just might happen to be that day after you use Snapy, The Floating Camera on Android. Unlike any traditional camera app, Snapy is designed to let you take photos no matter where you are or what app you’re using. With a single screen tap, you can launch Snapy over existing apps in a floating window, allowing you to take and edit photos on the fly. The floating window that carries the camera interface can be easily resized and moved around on the screen. It’s more like the floating video players we’ve seen in the past and on devices like Samsung’s Galaxy Note series. Snapy gives you full control and flexibility over the quality of images, letting you adjust exposure level, contrast, resolution size, white balance etc. You can also upgrade to the Pro version to unlock features like Scene Mode, start-up location of the floating window as well as its size, and an ad-free experience. All of the app’s features can be found on its Settings screen. The app provides three different methods to launch the camera app. First is the floating mode, which enables an always visible camera icon on your screen. You can tap on it and move it to your desired position. Second is the Notification icon, which – as the name implies – lets you launch Snapy from Notification bar. The third and last method is opening Snapy via a widget or shortcut. During testing, I found Floating Mode to be the most intuitive method to keep Snapy at your fingertips. When you hit that camera icon, a floating camera window pops up, after which you just have to point your device at your desired angle and hit the Shoot button. You can always close this window via taping the cross on the top-right. What’s so awesome about Snapy is that you can launch it even if you’re using another app, so whenever that perfect scene pops up, you can immediately capture it without any hassle. Not everyone’s as photogenic as they would prefer, so Snapy allows you to fine tune your pictures after you snap them via its integrated photo editor. You can spruce up your images with different filters such as retro, cinema, vignette, black & white and many more. The only shortcoming is that many of these options aren’t available in the free variant, and you will need to pay for the Pro version to unlock them. Nonetheless, you can still rotate and crop your photos as well as adjust their exposure and other basic parameters from the free version. Once ready, click Save and you’re done. Although not the very powerful camera app out there, it’s fairly hard not to recommend Snapy if you need to quickly capture photos of fleeting moments. Grab the app from the Google Play store.